Last summer, I was riding on the LIRR with a member of my extended family. For all intents and purposes, we’ll call him an uncle. We were riding on the train, drinking cold, 24 oz. Budweiser cans in brown paper bags. Outside, it was overcast; the clouds were slate blue and intermittent rain spit against the train windows. My uncle was, and is, in his mid-40s. We sat and drank and talked about work: his work, my work, working in the tech world in general, the imminent bust of the app bubble. Then, at one point, my uncle sighed and he said, “Here I am at 45, and I’m still trying to figure out what makes me happy. Who knew it would work out that way?” He didn’t say it with any kind of mid-life crisis mourning, but matter-of-factly—as if it were an aspect of life he wished his father would have relayed years before. All I could to was shrug and offer him a reassuring smile. But that moment has stuck with me; and probably will for the rest of my life. At the end of the episode, Ken surprises Pete and Roger during their meeting to discuss the accounts they’ll be picking up once Ken is gone. Ken tells them that he can’t accept his severance package because his signing bonus with Dow Chemical was so generous. He tells Roger and Pete that he’s going to be their client now and that he’s going to make their lives extremely difficult. Ken was given a way out, a way to chase down what makes him happy; first by his wife’s urging and then by the machinations of corporate business. Instead, he turns his back on the “sign,” on writing, on his wife’s wishes for him, and takes a job working for a chemical company. Who knew it would work out that way? Don is looking for signs as well. When Don and Roger are out eating a late night drunken meal with a bevy of women (wannabe actresses, models, or simply classic city party girls), Don sees their waitress and says that he recognizes her from somewhere. Roger is rude to the waitress and leaves her a $100 tip as a mea culpa. Later, when Don finds out that Joan and Peggy need help with the Topaz pantyhose account, he sees an opportunity to reconnect with an old client—Menken’s Department store. He even has a dream about Rachel Menken, his old love, modeling a fur coat as part of one the many casting calls him and the other office execs are indulging in. However, he soon finds out that Rachel has died. He’s visibly shaken. 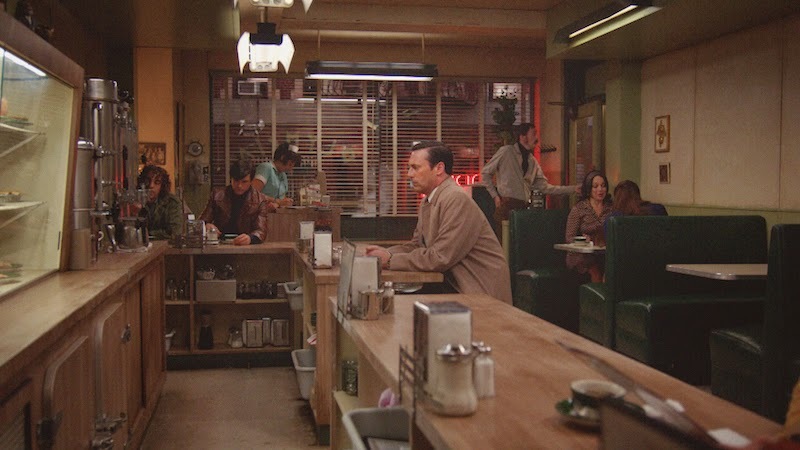 After work, he returns to the same diner he stopped at with Roger and the girls. He encounters the waitress once more. And, after she gives Don a somewhat subtle hint to meet her on her break, the waitress has a quickie with Don in the alley. It turns out she mistook the $100 bill as a sign—and mistook the source of the sign as well. Meanwhile, Peggy and Joan are treated like second-class citizens by some of the McCann Erickson account stooges. Then Peggy and Joan turn on each other. Peggy tells Joan that she should expect to be treated poorly by Neanderthal men when Joan looks and dresses the way she does. Joan tells Peggy that clearly it’s a problem Peggy has never had to worry about. To which Peggy responds: “You’re filthy rich. You don’t have to do anything you don’t want to do.” Joan tries to make herself feel better by going on a shopping spree, but the sales girl reminds her of her past. “Didn’t you used to work here?” In classic Mad Men fashion, Joan rejects her past and moves forward, telling the girl that she must be confused. And, Peggy, even though she broke through with the Burger Chef pitch last season and is successful and respected at work, has never taken a vacation and can’t even allow herself to give in to a new romance with John Mathis’ friend Stevie (“Stevie? How old is he?”). The line of the episode—at least to me—came from Ken’s wife, Cynthia Cosgrove. When she and Ken are arguing over why Ken should leave the firm, Cynthia says, “There’s always another hurdle.” And that’s what this episode, what this season, what this series, and what life are all about. Joan is filthy rich, but she still doesn’t have true professional respect. Peggy is successful and respected by her co-workers, but she can’t piece together a personal or romantic life. Don seemingly has everything, but he can’t grasp what it is that makes him happy or gives his life meaning; he constantly gropes for new signs and new experiences, whether its in the present or in the past. Ken keeps putting hurdles in front of himself to avoid doing the thing he very well may be the best at. We constantly avoid or are unable to truly find what makes us happy, because we’re worried about the next hurdle. And maybe that sounds New Agey, but it’s true. Maybe Rachel Menken died after living the life she wanted to live, with everything she wanted. But I doubt that a successful businesswoman like Rachel Mencken would think that way—there’s always another hurdle. Who knew it would work out that way? If only we could all retire early, learn how to cook Pop Tarts and say, “It was very good,” like Ken’s father-in-law.